BonSeP is a consulting firm in high-technology sectors (Energy, Transport, Aeronautics, Defense). Created by Hervé de Larquier after 30 years of experience in various industrial environments, it draws on his broad knowledge of the international standards of management. BonSeP advises on all elements of the value chain, from corporate to the operational teams. Utilising collaborative methodologies, its aim is to build flexible and simplified organizations to improve performances while respecting the culture of the enterprise. BonSeP also provides specialist advise in ILS/SLM. BonSeP ss an independent advisor to large corporations on organisational performance and technology solutions. BonSeP provides flexible partnerships tailored to client needs. During major program and project competitive tendering and kick off, implementation of a “win win” strategy and rapid mobilisation of skilled, experienced and motivated resources are the key drivers. Having participated in more than 50 international and national calls for tender, Hervé de Larquier develops a pragmatic approach of the best practices. BonSeP offer covers whole the value chain from the competitive strategy to the writing techniques and negotiation. Accepting the challenge, BonSeP will work side by side with you to produce and negotiate a winning tender. Competition always stronger, constant evolution of standards and customer’s requirements, new opportunities offered by technologies, evolution of staff’s aspiration are some of the many factors to which companies have to adapt themselves to assure their level of competitiveness. Based on the experience of the AREVA Transformation Plan, BonSeP aims to simplify in depth the business processes of a company by drawing the organisations untapped resources with a tailored change management approach. Integrated Logistic Support (ILS) is a set of regulations and standards developed by the NASA and the DOD to optimize Availability / Life Cycle Cost of complex systems within the framework of acquisition program. “System Life Management” (SLM) is a simplified approach applicable to the whole life cycle. Hervé de Larquier is one of the authors of the MINDEF’s reference books on this topic. He was appointed to represent France in the NATO workshops. He also taught the discipline within armed forces headquarters and in Supelec University. He has undertaken numerous advisory tasks for the state agencies and their industrial contractors. Hervé de LARQUIER, 58 ans, a commencé sa carrière en tant qu’Ingénieur système Optronique chez THALES. Il est enseignant à SUPELEC et co-auteur d’ouvrages de référence sur le Soutien Logistique Intégré. En avril 2000, la société SYSLOG rejoint le Groupe AREVA et devient RMC. Il prend en charge les fonctions de Directeur Général Délégué responsable des opérations. 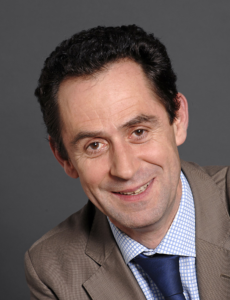 En 2005, il rejoint Technicatome en tant que Directeur Commercial Adjoint puis Directeur Commercial. En Avril 2010, il intègre la fonction commerciale du Groupe AREVA en tant Directeur Organisation et Performances. Il pilote le plan de performance de la fonction et à ce titre met en place l’harmonisation des processus commerciaux et des comités d’offres. Il initialise également la « Sales Forces Academy ». En décembre 2011, il assure différentes missions auprès du Directeur Général, dont le redressement du projet EPR en Finlande avant d’être nommé Directeur de la Performance du Groupe en avril 2014. Il anime également le « Program Management Office » de la transformation d’AREVA. En avril 2017, il fonde BonSeP consulting.